What’s buzzin' North of Boston is the season opener of Skip’s Snack Bar, serving up some of the best hamburgers for close to 70 years. 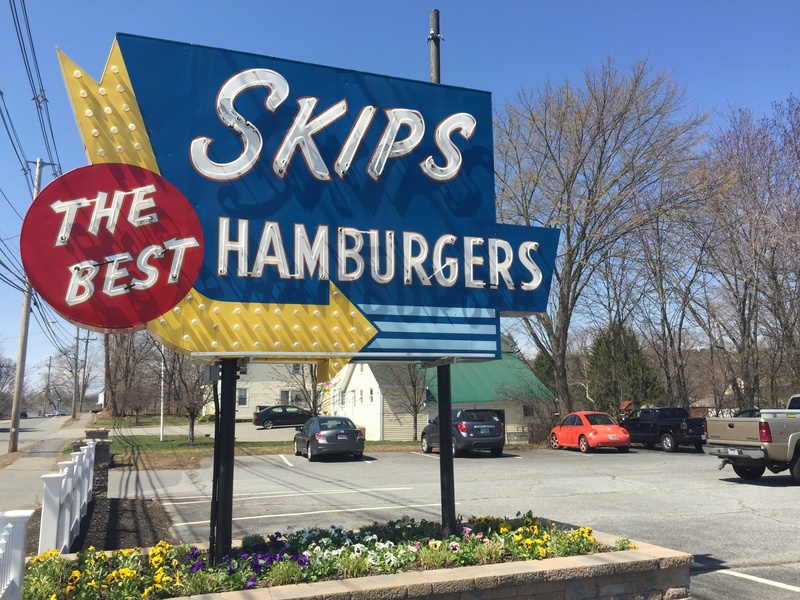 Located on Rte 110 in Merrimac, Massachusetts, celebrating opening day at Skip’s has become a long-standing tradition for many. Founded in 1947 by Dave Mathews, this radioactive hot spot is now owned and operated by his daughter Lori Mathews and son-in-law Rob Stepanian. “Today’s the day! We opened at 11, but people were lined up outside since 9 a.m. We’ve been doing this for a long time, and that’s always been the case so we were prepared,” said Stepanian. Cook, cookin’ and keeping things simple makes a Skip’s burger especially boss, topped with lettuce, tomato, pickle and mayo. Paired with a side of susie-q potatoes, this Fat City meal will for sure razz your berries. “We’re still fixing our burgers the same using quality local beef, and hand-cutting our susie-q’s fresh every day,” said Stepanian. 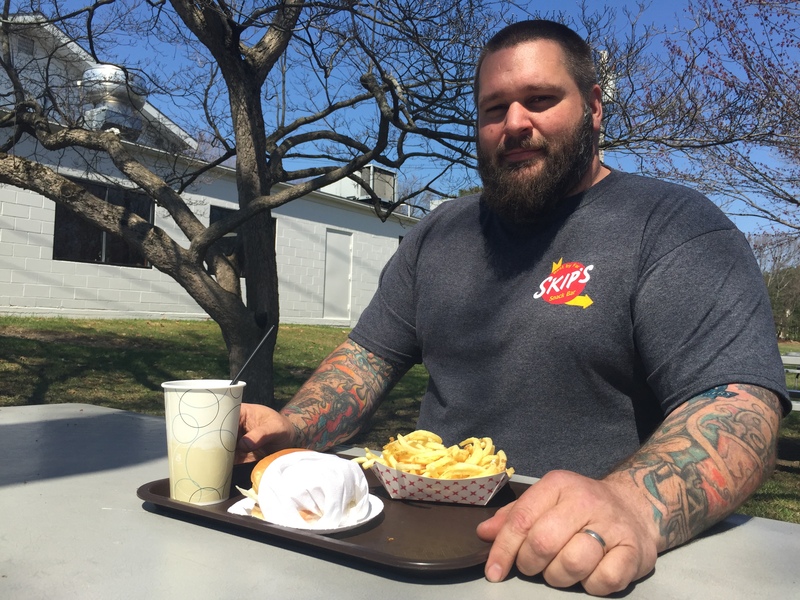 The first burger off the grille went to Merrimac local, and long-time Skip’s fan Scott Scherbon, Jr.
Scherbon has such great memories of going to Skip’s for ice cream after baseball games and for Sunday drives with his grandparents that this year, in honor of family traditions, he tattooed the Skip’s logo on his arm. The only person I spotted sporting a Skip’s tattoo, Scherbon certainly wasn’t the only one enjoying tradition. 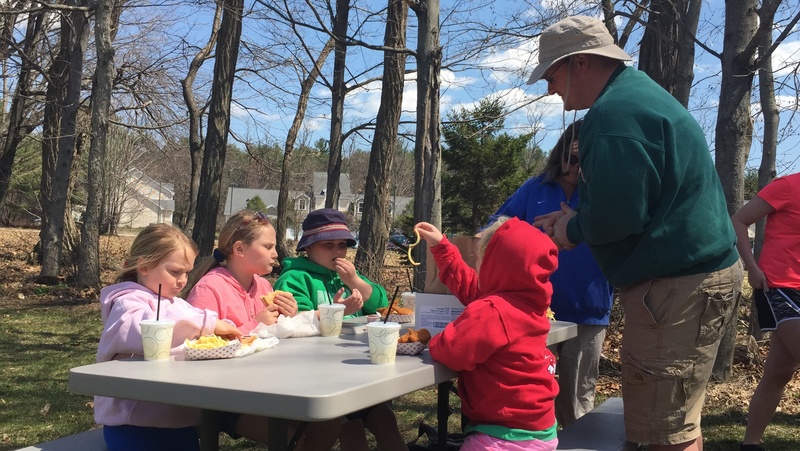 A few picnic tables away sat the Delano family (Camdyn, Casey, Callie, Carter, Tracey and Al) who were excited for their friends to arrive so they could order their first “chickens” of the season. “I’m a teacher and with our tough winter there was mention of moving Spring break to give us more days at the end of the year, but I thought, oh no, that will interfere with Skip’s opening day!” said Tracey Delano. In addition to the eats, Skip’s was and still is a hot-rod passion pit. On various Saturday nights, you can bash ears and cast an eyeball on fired up flip-tops, deuces, and chrome-plated Bent Eights with Paper Shaker mirror warmers tied around the rear view mirrors. And while these jacked-up rockets aren’t popping clutches for pink slips, I’ve heard schooches are competing for vanilla slugs and due backs. How many 1950’s slang references can you count in this story? Let us know for a chance to win a prize at iNFO@PeacockMedia.com -> Multimedia Storytellers #SharingStories about Food & Drink North of Boston, Massachusetts. Now don’t forget to watch our 15-second Instagram video to see Skip’s original menu from 1947!